Young Tabby Aykroyd has been brought to the dusty mansion of Seldom House to be nursemaid to a foundling boy. He is a savage little creature, but the Yorkshire moors harbor far worse, as Tabby soon discovers. The ghost of the last maid will not leave Tabby in peace, yet this spirit is only one of many. Why do scores of dead maids and masters haunt Seldom House with a jealous devotion that extends beyond the grave? Why did I read this book: I love Clare B. Dunkle’s writing and when I learnt this was a prequel to Wuthering Heights I knew I had to read it – creepy cover be damned. 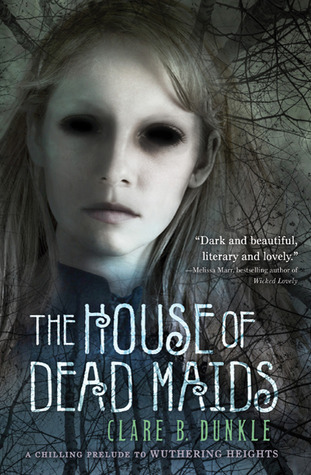 The House of the Dead Maids is described as a prelude to Emily Brontë’s Wuthering Heights. I was curious about this connection to one of my favourite novels and since I have enjoyed other books by Clare B. Dunkle (The Hollow Kingdom and By These Ten Bones), I decided to give this one a go. It tells the story of orphaned Tabby Aykroyd as she is taken to the old mansion called Seldom House to be the nursemaid of an unnamed, unruly young boy referred to as the “heathen git”. As soon as she arrives at the House, the “young maid” Tabby is haunted by the ghosts of previous maids inasmuch as her charge, the “young master” is haunted by the ghosts of previous masters of the House. These supernatural encounters prove to be the least of their worries as they realise that each of them seems to have a role to play in a long-lasting and terrible tradition. At merely 146 pages The House of the Dead Maids is an extremely quick read but ultimately, I found it to be an ok yet unremarkable read. 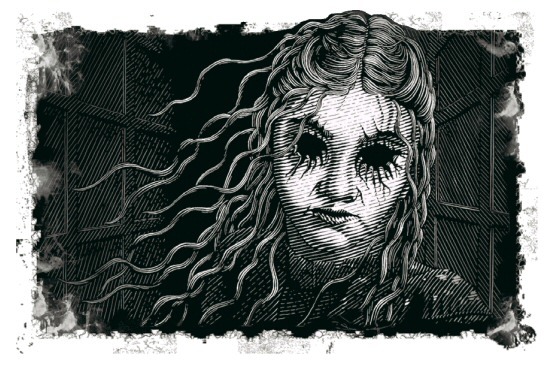 The story has its scary moments especially the first scenes when Tabby arrives at the house and the illustrations that open each chapter are super ultra creepy. It is also appropriately Gothic given its connection with Wuthering Heights with the presence of ghosts, the haunted mansion, the lurking evil, the Yorkshire setting. All is indeed very… adequate and you can see my predicament here: I find myself without a lot more to say than the above and I guess that says a lot in itself? Although there were interesting moments especially concerning Tabby’s religious faith (in comparison to the lack of faith of the House’s inhabitants) and her attempts to connect with her charge and his adamant need to be the “young master”, the story itself is very, very familiar with its theme of “villagers-turned-to-evil-sacrifice” a la The Wicker Man. Bear in mind though this is the second Horror book I’ve read this week with this theme so perhaps my reaction has been somewhat influenced by the ghost of Popular Plots. As for the connection to Wuthering Heights: this point is not made clear till the very end of the novel when everything comes full circle, when real and fictional come together. You see, Tabby went on to work as a housekeeper to the Brontë Family and in Real Life, the Brontës did have a housekeeper named Tabby who liked to tell ghost stories like this one and who seems to have influenced Emily Brontë a great deal. It is perhaps too meta for me but might work for others. I woke from a heavy sleep to the sound of a person shaking down the ashes at the hearth, but when I opened my eyes, I saw only the dense shade of a little cloth room. A moment later, a woman pushed back heavy green folds beside me, and light streamed in and lit up twinkling motes of dust. I was in a curtained bed so large that I could stretch out both arms and not reach its sides, and so high that I had to climb down a wooden stepladder drawn up beside it. I might have hurt myself tumbling over the edge. “Whose room is this?” I ventured to inquire, awed at my surroundings. She took a string from around her neck and held it at my collarbone while she bent to check its length to the floor, marking the intervals on it with a chunk of coal. She had a broad, dumpy figure and freckled arms with dimples at the wrists, sparse grizzled hair, gray eyes that studied the world with sour disinterest, and a seamed mouth cinched up tightly like a miser’s purse. “Where is the other girl?” I asked, turning around so she could find the span of my shoulders. The morning light shone through a small window set with uneven diamond panes of blue and amber glass, throwing a harlequin pattern onto the wooden floor and brown gritstone walls. In the corner towered a great oak clothes press decorated with puffing faces and roaring animal heads. By the bed, a little table held an earthenware pitcher and washbowl, and next to me at the hearth stood an upright chair, with my garments laid across it to dry. A very old mirror hung by the door. Fashioned into its beadwork frame were fanciful scenes of fighting birds, but the glass was so smoky and streaked that it returned little by way of a reflection. “I heard the other girl in my sleep,” I said. “I heard her get up and wash. See, the other pillow’s dented.” And I pointed at the bed. Also, the author has interesting articles about writing and researching for the book. Rating: 5 – It was ok. I really enjoyed this book. I liked that although I hadn’t read Wuthering Heights previously, this works fine by itself. The notes at the book explaining who Tabby was supposed to be was a nice touch too.
? Under The Mountain’s Review of The House of Dead Maids ?